When it comes to planning a trip, it’s very rarely easy. Which destinations do you want to visit? What is the optimal route? How many nights are sufficient to stay in each place? What is there to see in the area? And, if you’re hitting up a number of countries in one trip, how do you manage the booking process through so many destinations? How to plan a trip to Europe. Usually this is all so overwhelming that the responsibility for planning your trip is handed over to a travel agent. Or you join a bus tour. 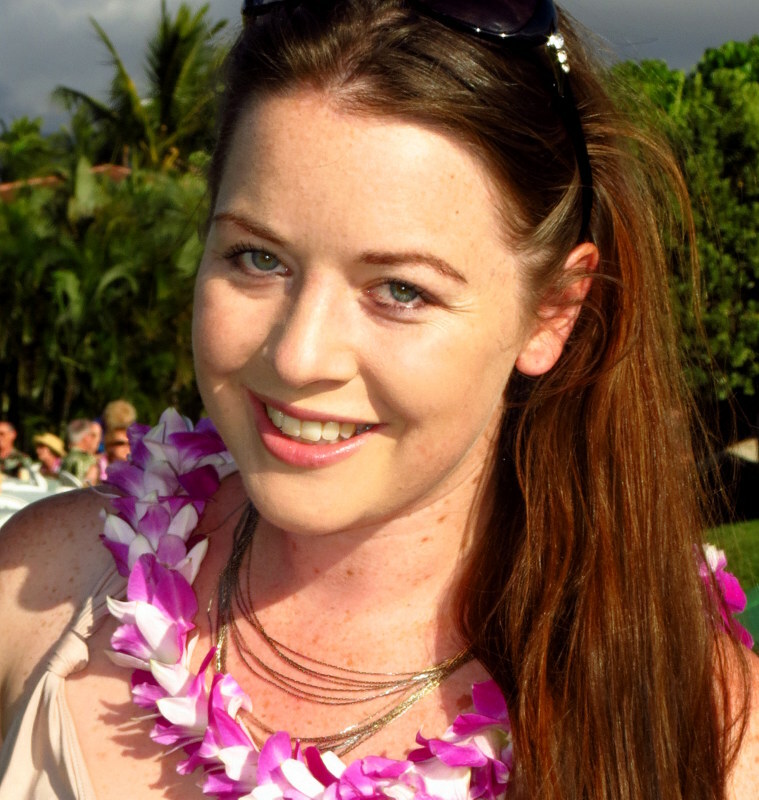 Though what if you could be your own travel agent? 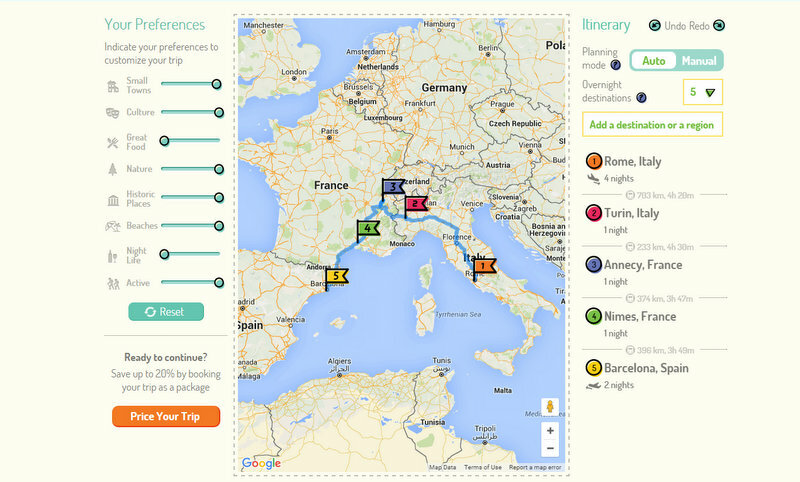 What if planning and booking a multi country trip through Europe was genuinely easy to do? Planning all of a sudden becomes fun instead of a headache, and without realizing it you’ve become your own travel agent. 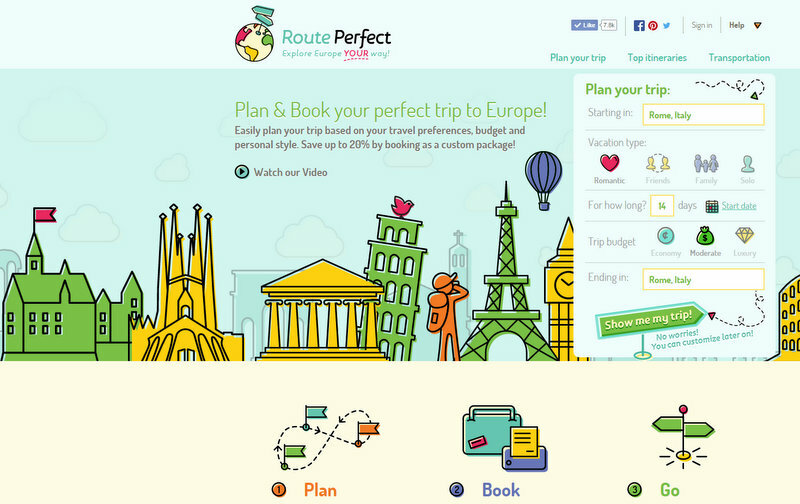 Planning a trip with RoutePerfect is the perfect way to explore the world – your way. RoutePerfect maximizes the travel experience by suggesting the optimal trip for the time you have and the things you love to do. If we’re to believe guide books and blogs, everything nowadays is a must see. Every experience is a must do. Though if there’s one thing we’ve learnt, it’s that someone else’s experiences aren’t always the perfect fit for you. For instance you might visit Milan because you’ve been told it’s something you have to do. But why? What’s there for you? It turns out that those rave reviews about the city have been from shopaholics, but you’re not really interested in designer fashion. Once you get there, you’ll probably find that there’s not a whole lot for you to do. So when planning a trip and choosing your destinations, it’s essential to consider the things you like to do. 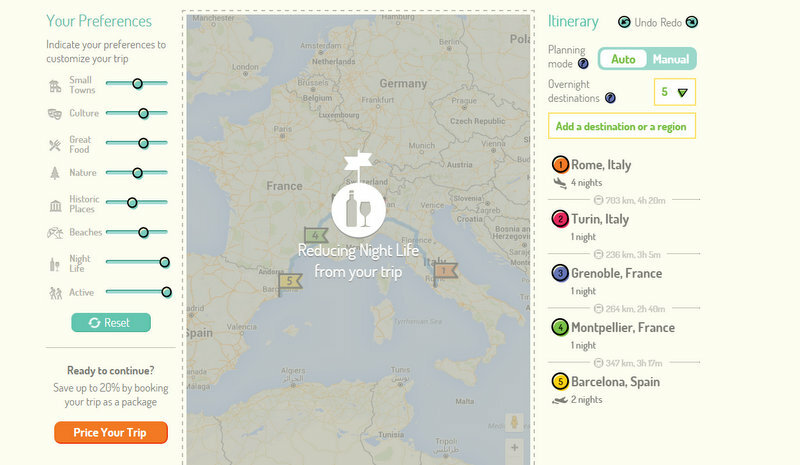 RoutePerfect makes it really simple to plan the perfect trip for you. You choose a destination to start your trip and a destination to end, and then the platform generates an itinerary for you based off your budget and preferences. Don’t care about nightlife? Completely remove that from your trip. Your itinerary will update and a different set of destinations will appear. Want more culture or beaches? The platform will add that to your itinerary too. You can then read about your trip in full detail and see the attractions suggested for you. Tips for planning a trip to Europe. What do I need to know to plan a Europe trip? This is an incredibly powerful planning tool, and the fantastic thing about the platform is that it recommends destinations and attractions for you. It’s a godsend for the indecisive traveler who wants to go to Europe though really has no clue. Though it’s also an amazing planning tool for those with set ideas too. Need help planning an itinerary for Europe. The itineraries first generate with what the platform suggests for you, though each trip can be fully customized, and customization is easy to do. 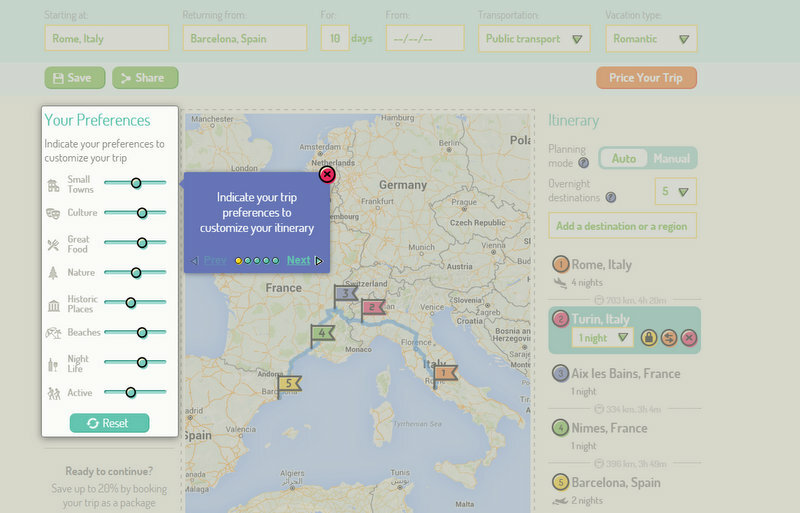 Add a destination or region if there’s somewhere you’re dying to go, and the platform will fill in any itinerary holes. You can leave some of your trip up to imagination, or pick a suggested European itinerary as a whole. European itinerary ideas. RoutePerfect completely eliminates the time you would normally spend on consulting guide books and wading through information online. The process of planning is fast and incredibly smooth, the site is very easy to navigate, and the platform really does deliver the perfect trip! But this isn’t just a platform for planning – after you’ve settled on a perfect itinerary you can easily book it all too. Need ideas for an itinerary for Europe. The ability to book your whole trip as a package makes the planning process so easy. Once you’ve settled on a perfect route, you have the option to price your trip. As with other travel price comparison websites, RoutePerfect searches from over 100 different suppliers to ensure you have options for the most competitive rates. How to book a whole itinerary at once. And once again, your booking preferences are totally customizable. 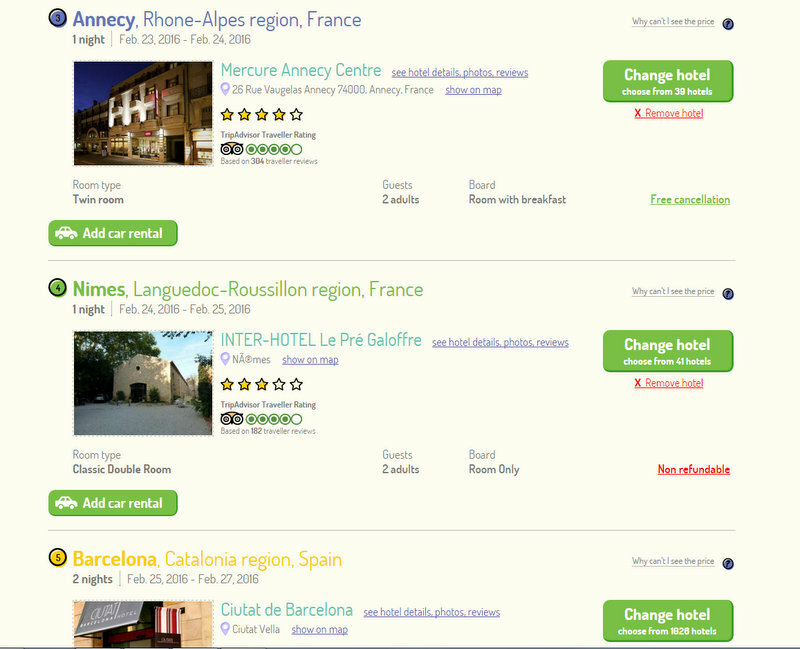 For those who want as little research and planning as possible, the platform automatically offers hotels for you. After hitting “price my trip” you are presented with a full itinerary, including default hotel recommendations for each evening based off your budget, hotel’s location and TripAdvisor ratings. You can book it all instantly in one transaction without making any changes if you want to. Though should you want to choose your own hotel and weigh up other options, the platform offers plenty of alternatives too. Hit “change hotel”, and a list of hotels in your selected city shows up. You can sort and filter results by price, tripadvisor ratings, stars or name, pull up relevant property and location information, and add the room to your itinerary after you’ve made your choice. All without having left the page. It’s so easy. There is then the option to add a car rental to your booking for each city of your trip, and the platform offers the total package price at the bottom of the page. If you find a better price for that same package elsewhere online they’ll give you $500 towards your trip. They’re quite confident in offering the most competitive rates! Easiest way to book an international trip. You can save your itinerary for later, or share it via social media. The whole process of planning and booking is so straightforward and simple, that you’ll find you’ve become your own travel agent without realizing it, and that you can do everything they can do. Book your own international travel. I can highly recommend Route Perfect as the best trip planning tool we have found for Europe – it offers the right amount of choice and information without over loading you with content. It offers up places you won’t have thought of as well as history and information about each, and allows you to make the planning process as involved as you want it to be. The travel is carefree – everything is sorted out in advance and all you have to do is present your voucher and the hotel will already have all your details. It means travelling without worries and quicker check in, basically like printing your boarding pass for your flight at home and avoiding the process. Booking your trip as a package this way saves up to around 20%. When comparing prices offered directly through individual hotels and car rental companies and adding these rates together for a total price of a trip, RoutePerfect beats it. I want to be my own travel agent. So explore the map, discover destinations and plan your trip. Then create a package, choose what’s in it and book the entire trip at once. What if you could be your own travel agent? 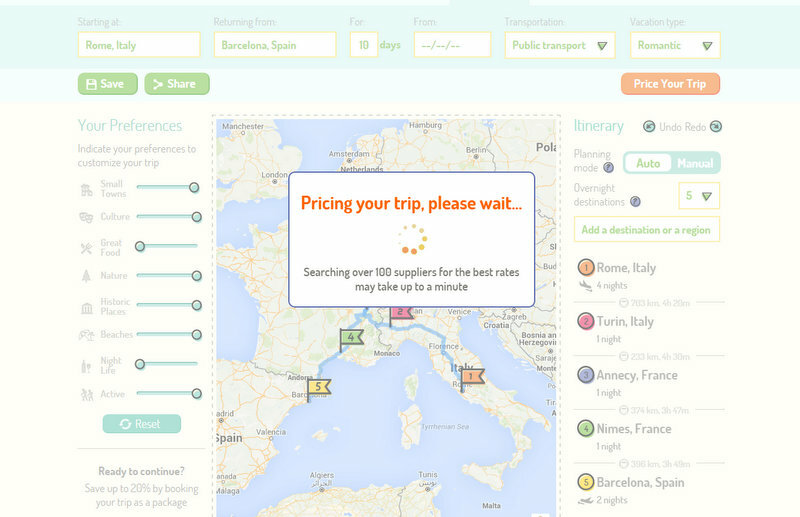 What if planning and booking a multi country trip through Europe was genuinely easy to do? Hey megan! Thanks for this lovely blog!! I can recommend the hosteldeals card because that will saves you a lot of money in Europe! Have a wonderful time in Central America … and definitely consider pulling up RoutePerfect if you find yourself randomly in Europe in 2016! Hey, that’s just about perfect! I’m planning a two week holiday with my mum in Europe next month! I’m totally giving this a try now! sounds like a pretty comprehensive planning tool with lots of different aspects covered. There seems to be a major shift at present towards these planning type sites that do everything for the traveler such as tripeasel as well doing the same thing. Starting to plan our trip to Europe later this year think I will give this site a look. It’s so comprehensive, though so easy to navigate and use at the same time. They’ve really struck just the right balance between giving you enough options and choice without making you feel as though it’s information overload. Really impressed and highly recommend! Even if you do love doing all of the planning and research before a trip, this is definitely a great way to compile some ideas for the backbone of your itinerary before you get started. I’ve spent quite a few hours just playing around with generating different itineraries – it’s so much fun! I love planning my own itineraries, but sometimes I feel like I’m leaving out cool things that I didn’t even know existed, or I’m not finding the perfect hotel. This tool sounds really great for helping to fill in the gaps and how great is it that you can book it all together here. I appreciate that kind of help! This will absolutely help with that! And then it’s so easy to book everything at once all in one go. The booking part is one of the biggest hassles, so gotta love something which does it all for you! Meg, thank you for sharing information about the Route perfect tool – it sounds like a great option to more quickly put together a trip itinerary. I will keep it in mind for next time I head to Europe, and hopefully they will expand it in the future to cover the rest of the world. This looks like an awesome resource. I’ll have to save it for when I have friends heading to Europe. I’ll eventually get back there but it might be awhile, other adventures to have. Thanks for sharing. Absolutely! I’m hoping that they’ll soon expand past Europe and have a planning option for other regions of the world too. It’s such a brilliant tool! Thanks for this information, RoutePerfect looks very comprehensive and helpful. I will have to try it on our next Europe trip. You’re welcome Rhonda – definitely give it a go on your next trip! This sounds like a fantastic way to plan a trip! We love hunting down information to put together an itinerary but sometimes it is exhausting and time consuming. Since we’re planning on travelling Europe more, we’ll definitely have to look into this! Absolutely! It just makes everything so simple doing it through a planning tool like this, though still allows you enough freedom and flexibility to keep it fun! This seems really user friendly and I love that they take your budget into consideration. Great tips. Thanks for sharing. I love travelling and with proper planning we can save a lot and enjoy more. You’re welcome Wilky :) I’ve always said that maximizing your enjoyment comes down to the 6 P’s – prior planning prevents piss poor performance lol. So this definitely helps with the prior planning side of things!! Thank you for this post. Such great useful details!. I’m glad we could help. Happy travels! The only component I’m missing is the ‘best time to visit’ for places I have in mind…Maybe they could integrate information from the sources like RoveMe or ResponsibleTravel to cover such an important aspect of travel as the right timing?